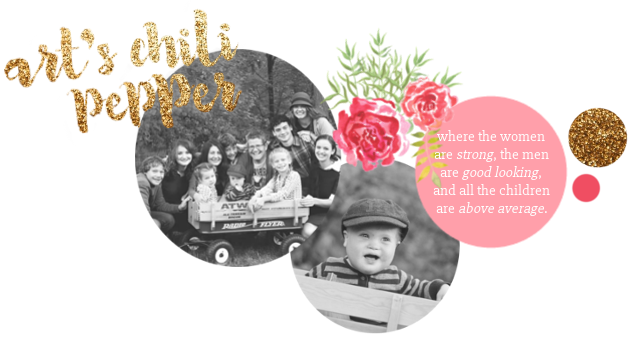 Art's Chili Pepper: I Have a Button! My dear daughter, Brianna, got it in her head to make me a button for my blog. She made some contacts, through my blog world friends and did some Google research. Three hours later she presented me with this beautiful piece of artwork. The price for this lesser quality product was ridiculous and I left without the tea cup that I thought I might bring home. Which is probably better because we had NO extra room in our vehicle after a month of traveling with 9 in tow. But, come Christmas morning, I opened up a gift from Brianna and what do you think was inside? A vintage Royal Albert tea cup, made in England, that she had saved her money for and researched on the web and then purchased on eBay. So, my point is, before I even knew that I wanted a blog button, Brianna figured it out and invested her time into making it for me. And here it is. I am DELIGHTED with my little Chili Peppers. Thank you, Nana. She is so resourceful and loves to try out new things. She is getting interested in HTML,of which I know nothing, so I am really thrilled at the prospect of having someone who knows how to fix all the problems I make! And that is definitely one of the great things about having so many kids around. They are all specialized in something that I know very little about and don't necessarily have time to learn. Brianna is a whiz at computer stuff and desktop publishing. Kaitlin can get any stain out of anything. The girls are both very talented musicians who are teaching their younger siblings to play piano. Nathaniel is getting very good at fixing little things around the house and building things with wood. I don't need to tell you how useful that is. So even though we have much more to do than the average family, we are able to do much more with what we do. I understand that Erica and Hope had a little hand in it...thank you ladies! Nice button - way to go, Nana! How sweet of Brianna to do this for you! It is a great button too! That is such a sweet thing for her to do and I bet you cried when you opened your gift and saw the tea cup. What a sweet daughter you have. I love your button and will have to grab it. Erica is so sweet to help too. She made my button. Your girls are amazing! Good Job, Nana! What a smart girl! And so thoughtful, too. She has a good momma! I am just so impressed that she "got it" on her own. Way to go, Nana!!!!! GREAT JOB!!! And now I'm totally crying over that tea cup. What a sweetie! How fun!! It's so cute. Lovin it! Adding it to my blog right now! I grabbed your button. Your kids are so sweet and talented. God bless them all.